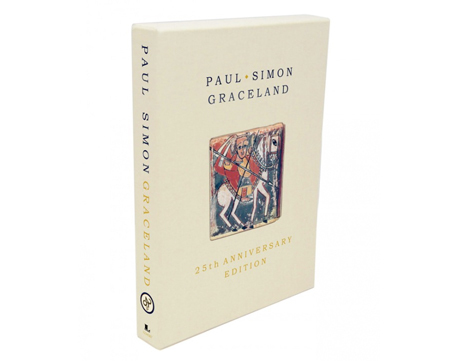 We knew that Paul Simon would be celebrating the 25th anniversary of his iconic Graceland with a retrospective box set, documentary and tour. Now, the folksinger has shared the details of the various expanded reissue packages that will be coming our way later this year. - A two-disc CD/DVD set with the remastered album, five bonus songs, an audio documentary, the documentary film Under African Skies, music videos, and a Saturday Night Live performance. - A box set containing two CDs and two DVDs. These contain all of the material from the standard package listed above, plus a 1987 concert filmed in Zimbabwe, extended interviews from Under African Skies, and various goodies such as a poster, lyrics pad and 80-page book. - A remastered vinyl edition that includes a poster, plus a download card containing the full album with three bonus tracks. This will initially be released on April 21 at participating Record Store Day locations. - An "ultra-deluxe" box set with the standard box set, along with the heavyweight vinyl and a signed and numbered poster. Thee will be available in limited quantities from Paul Simon's website. There will also be a standalone Blu-ray release for Under African Skies. As previously reported, this documentary was filmed by Joe Berlinger (Metallica: Some Kind of Monster) and shows Simon travelling to South Africa to reunite with some of the collaborators who appeared on Graceland. The film will make its television premiere on A&E sometime this spring. It will also have its Canadian theatrical premiere on April 4 at 6:30 p.m at the Bloor Hot Docs Cinema in Toronto.